This interactive visualization at the Wall Street Journal shows who “wins” in a variety of variable match-ups from having the highest murder rate to eating the most beans. Population is shown above. Over the next 100 years the Earth’s population distribution is set to change radically, with China declining after 2030 and Nigeria, with the rest of Sub-Saharan Africa, skyrocketing. Click through for an extensive collection of additional graphs. 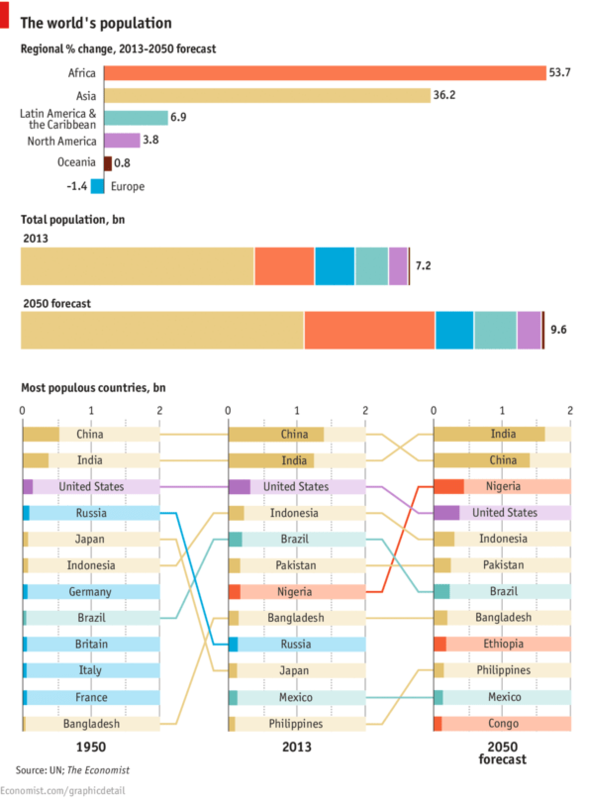 The United States is expected to become the 4th most populous country in the world, behind China, India, and Nigeria, by 2050. In addition, India is predicted to outgrow China. TED Talk: Are Droids Taking Our Jobs? This fascinating TED talk explains the current trends in productivity and profitability with a comparative lack of growth in jobs per capita. In short, advances in technology are replacing people in all job sectors, but McAfee argues that this is a good thing and we are only in the initial stages. Guiding this change will be a distinctly 21st century issue and this talk explains, with extensive use of economic, population, and historical data, how computing advances will radically alter our futures.